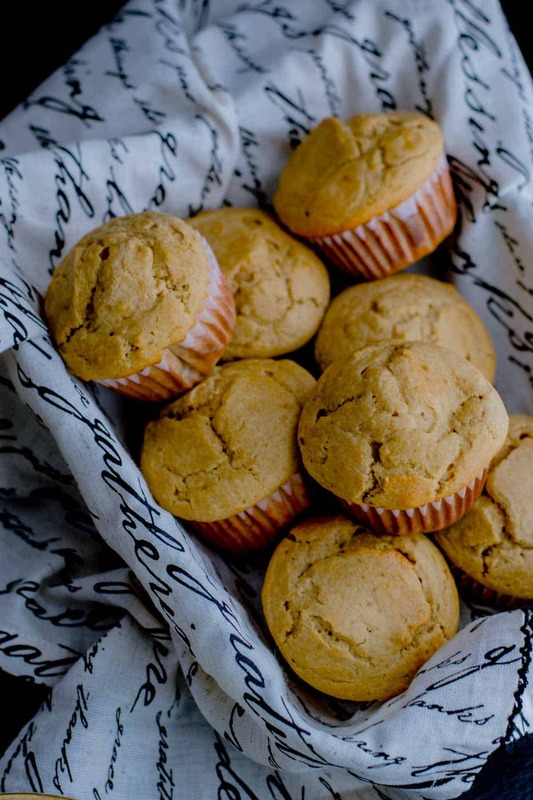 These moist and delicious Whole Wheat Banana muffins are perfect for your kid’s school lunch or after school snack. The best part – 30 minutes is all you need to whip them up! Do you have overripe bananas at home? I usually do, especially during the weekends. And here’s why – my mom has me convinced that kids need to eat bananas every day. So every week I dutifully buy bananas with the hope that Twisha and Anaya will eat them. Most Mondays and Tuesdays they do but by Wednesdays, they are giving me the stink eye. By Friday, I realize that if I don’t either make Banana Bread or Banana oats muffin, these overripe bananas will have to make its way to a trash can. Having made Banana bread two weeks in a row, I decided that it was time to bake something different. Banana oats muffin seemed like a good idea but I wanted to use ONLY whole wheat flour this time, instead of all purpose flour as the main ingredient. Also, I wanted to use coconut oil instead of butter. 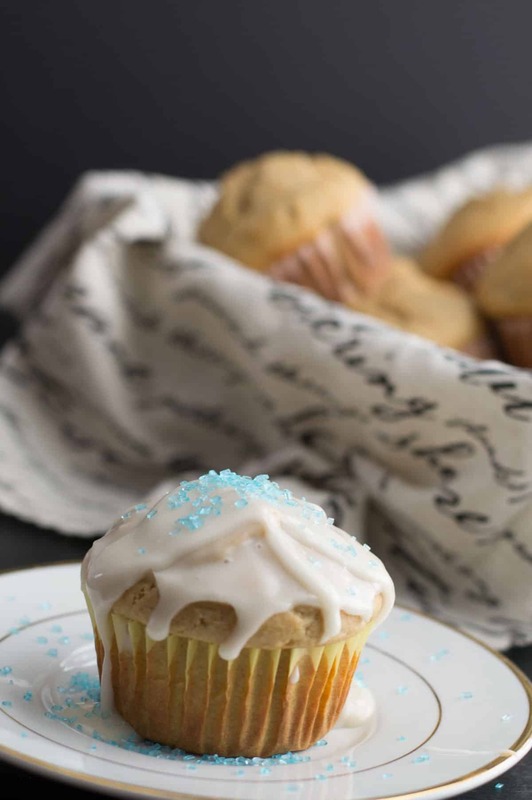 When I searched for a recipe that would fit the bill, I found this great resource/blog post on Handle the heat on making the ultimate muffins. What I loved about that post was that the author (Tessa) used different ingredients such as applesauce, whole wheat flour, buttermilk, melted butter etc. in her muffin batter and documented the outcome. Now, as far as using coconut oil for butter was concerned, I had done that in the past with this Banana bread recipe so I felt confident about that and came up with this recipe. While I used my Blendtec Total Blender to make the batter, you don’t necessarily have to. The directions below will reflect both methods. 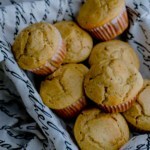 These moist and delicious Whole Wheat Banana muffins are perfect for your kid's school lunch or after school snack. The best part - 30 minutes is all you need to whip them up! Preheat the oven to 450°F. Grease the muffin pan with cooking spray or butter or use muffin tin liners. Mix all the dry ingredients - whole wheat flour, brown sugar, baking powder, and salt till they are combined. Set aside. In a mixing bowl, add the mashed bananas, coconut oil, milk, vanilla extract, and eggs and mix them well. Add the flour mixture and mix them in till they are combined. Do not overmix! The batter should be thick and not runny. Scoop the batter into the greased muffin tin till the tin cups are a little over 3/4th full. Bake at 450°F for 5 minutes and then reduce the temperature to 400°F. Continue baking for 12 minutes until a toothpick inserted in the center comes out clean. Remove from the oven and let the muffin cool in the pan for a few minutes before transferring them to a wire rack to cool completely. Mix all the dry ingredients - whole wheat flour, baking powder, and salt till they are combined. Set aside. Add the mixed dry ingredients - whole wheat flour, baking powder, and salt to the blender and secure lid. Press "Pulse" 3–5 times or until dry ingredients are combined with the wet. Do not overmix! “Bake at 400°F for 5 minutes and then reduce the temperature to 400°F. ” It’s the same temp (400F) so got confused. Thanks again for sharing!! Looking forward to giving it to my kids. Hi Maddy, thanks for stopping by. And great catch, start with 450 degrees F and reduce it to 400 degrees F. Sorry about the typo and thanks for catching it and letting me know. I have fixed it now.